That Frank Schilling Prediction about dot COM Was WRONG, Surprised? Frank Schilling has been wrong about a lot of things, as have ICANN and everyone else involved with promoting and trying to sell ICANN's new gTLDs (new generic top-level domains). Frank made a bad decision early (before the new gTLDs even launched) to abandon his core constituency and join other new gTLD hucksters--registry operators--as well as some current or former ICANN Directors, Officers and staff, and other fellow travellers, in utilizing a new gTLD marketing strategy of going negative against the legacy gTLDs, particularly the market dominant .COM. “It’s tough to make predictions, especially about the future." 2015: .info shrinks, com flatlines, some NewG accidentally GA's a name they need + barters premium to get it back. Biz gets beat by a New G.
Frank Schilling (Feb 15, 2014): 2015: dot COM flatlines -- Flat, as in no growth? Dot COM didn't "flatline" in 2015 but actually increased registrations by 8.4 million domain names, which is more than the increase in domain name registrations during 2015 for ALL the new gTLDs combined (7.5 million; source: ntldstats.com), including all the "fake" new gTLD registrations by affiliates of new gTLD registry operators merely for warehousing and resale. For an honest assessment of ICANN's new gTLDs from a "business" and "domainer" perspective, look no further than Rick Schwartz's recent post--his assessment--"I have never seen so many negative variables in any business in my life." Once current ICANN President and CEO Fadi Chehade is gone, whether March 12, 2016, or sooner, who will be more relieved: Steve Crocker or Larry Strickling? Will Fadi move to China and run the "Wuzhen Initiative" for the Communist Party and government of China? Or instead, will Fadi follow the footsteps of his former ICANN Chief Strategy Officer and become Executive Director of his favorite ICANN stakeholder-lobbyist organization? Or, alternatively, will Fadi be offered a part-time job (to add to his portfolio--"it's payback time, baby!") by the only ICANN stakeholder-lobbyist organization which ICANN actually "got in bed with" (joined as a full member) during Fadi's tenure as President & CEO? Will NTIA and the Obama administration pull the plug on the IANA transition after Chehade's Wuzhen shenanigans, OR will Congress actually allow the IANA Transition to happen (assuming it gets that far), OR will Ted Cruz, Marco Rubio or the Real Donald TRUMP stop it dead in its tracks? Will both, or either, .WEB and .WEBS be delegated into the Internet Root in 2016? Will Google finally figure out it has no clue how to market domain names or run a registrar or registry, and should have never gotten into the domain names business? When will Alphabet realize its brand name and domain name [abc.xyz] are both lame? What will happen to Yahoo? Which new gTLD will be the first to Go Dark (and take down all its websites with it)? Which new gTLD registry operator will be the first to file bankruptcy or receivership? How will the U.S. government ensure that its trusted contractor, Verisign, continues as the Internet's Root Zone Maintainer? Will Verisign be indemnified by ICANN, and PTI, once Verisign no longer has the benefit of U.S. government contractor immunity as Root Zone Maintainer? In that case, if ICANN's new gTLDs expansion crashes the Internet, could Verisign end up owning ICANN and PTI and/or all their assets--deja vu Network Solutions circa 1995? When will the music stop for Neustar and $NSR shareholders in 2016? Which U.S. law firm will be the first to file a lawsuit (e.g., antitrust) against ICANN, or its subsidiary PTI, once ICANN no longer has U.S. government contractor immunity (tentative end date: September 30, 2016)? What new potential legal liabilities (pdf) will every gTLD registry operator have after ICANN is no longer a U.S. government contractor? What will be more popular with governments, network administrators, and consumers around the world at the end of 2016: ad blockers or TLD blockers? Will ICANN ever be accountable? OK, everyone already knows the answer to this one: No. See also: After Wuzhen, Should ICANN President & CEO Fadi Chehade Be Fired? Best ICANN CEO Quote of 2015: "My Neck Will Be Cut Tomorrow Morning"
Image above: Seppuku by Rev. R. B. Peery. Image in the Public domain via Wikimedia Commons. "Now, if I’m sitting at the Board [of Directors] seat and I know that if I don’t do what my community tells me, my neck will be cut tomorrow morning, how will I really pay attention to the Public Interest?" - ICANN CEO Fadi Chehade explaining to the GAC on October 17, 2015, why the Membership Model doesn’t work for ICANN. See: GAC Oct 17: ICANN CEO, CCWG Co-Chair, Ships Passing in the Night? Anonymous Hacks .... | Softpedia: "... [e]ven worse, at the same conference, ICANN (Internet Corporation for Assigned Names and Numbers), the organization that is in charge of managing domain names, has also pledged their support for a new plan for running the Internet, where Chinese figures have a more powerful word in the decisions taken by the organization. Since next year, ICANN will take over more IANA (Internet Assigned Numbers Authority) functions from the US government, this would give the Chinese government more power in how the global Internet is managed ...."
“I'm not going to be steamrolled” - ICANN CEO Fadi Chehade to CCWG Co-Chair Thomas Rickert in Los Angeles, September 26, 2015, in response to Rickert not allowing Chehade to show a slide indicating where the ICANN community had not reached consensus about CCWG's proposal for "enhancement of ICANN accountability." See: ICANN CEO Fadi Chehade "Steamrolled" by CCWG-Accountability Co-Chair. Fadi Chehade: "Shall I answer this in Arabic?" Initial response of ICANN CEO Fadi Chehade to question (in English) submitted by Editor of Domain Mondo at the ICANN 54 Open Forum, after Chehade was directed to answer the question by ICANN Board Member Erika Mann (after consulting with the Board). See: ICANN 54 Public Forum Video, Q&A, ICANN, INTA, IANA, Lobbyists. Note: Fadi still has not followed-up and provided an answer to the question as he promised to do on October 22, 2015. Surprised? Fadi Chehade: "This is an important point because there's a definition of lobbyists but it's not people who influence outside of the U.S."
Steve Crocker: Stop. Please stop. Fadi Chehade: This is actually wrong. UPDATE 22 Jan 2016: Fadi "bags" another one "on ICANN's dime" to add to his "Portfolio"
Q: "... it appears that the Board was briefed by Fadi on his role as Co-Chair of the Advisory Committee after it was publicly announced that he had accepted the position, indicating that the Board was not advised in advance of his decision to accept the role. Is that a correct interpretation of the sequence of events?" Answer from Bruce Tonkin, ICANN Board Member: "Yes." Above: Tweet of ICANN President and CEO Fadi Chehade, and Reply Tweet from Andrew Sullivan (Sullivan tweeting from his personal twitter account). Sullivan is Chair of the Internet Architecture Board (IAB) and active in both IETF and ICANN. High-level advisory committee established for World Internet Conference: "A high-level advisory committee for the World Internet Conference's (WIC) organizing committee secretariat was established on Wednesday, the organizing committee said Thursday. The advisory committee held its first meeting on the sidelines of the second WIC in Wuzhen of east China's Zhejiang Province. Jack Ma, founder of China's Internet giant Alibaba, and Fadi Chehade, President and CEO of ICANN, act as co-chairman of the advisory committee...."
The negative reaction on Twitter and the ICANN CCWG-Accountability public mail list was almost immediate. Subsequently Chehade posted a response on the ICANN website in which he said the "first meeting" of the advisory committee "will take place in Summer 2016" which the official Chinese press report above contradicts. 1. That Fadi Chehade continuing as ICANN CEO, even for a few weeks until March 12, 2016, puts at risk the entire IANA transition process, from CCWG-Accountability and its Chartering Organizations, to alarmed Republicans and Democrats in Washington, D.C.
Chehade felt obligated to repay Alibaba's Jack Ma for joining Chehade's top-down, ICANN-funded project known as the "NETmundial Initiative" after most of the global internet community had rejected Chehade's leadership and vision for that "initiative" which isn't going anywhere and most likely will be defunded by ICANN after Chehade is no longer CEO. Note that Jack Ma and Chehade are also Co-Chairs of the NETmundial Initiative. Anybody who believes Chehade's after-the-fact stated rationale for his actions and words in Wuzhen --that he will somehow be able to successfully advocate multistakeholderism, which would require a complete sea-change in Beijing's worldview of internet governance and the already stated objectives of the Wuzhen Initiative-- must be naive or gullible. But that's too often the way of ICANN or at least its current CEO: spin the narrative and hope no one is able or willing to see and speak the truth. "This is not just a matter of judgment, but a matter of cross-cultural judgment. The [ICANN] CEO gets paid to get this right. And I REALLY expected better from Mr Chehade' in that department. Actually, I would not have expected this kind of behaviour from recent previous CEOs. Certainly not from Paul [Twomey]. In fact not even from Rod [Beckstrom], who despite his public persona and irritating Hollywood rockstar ways was, in many ways, quite sensitive to non-US cultures! In China, relationships matter. Appearance matters. A lot. Both of those things can be as important, if not more important than the 'letter of the law' as to whose dime he was on when carrying on the discussion with the relevant actors inside China. The American way (and the British, to a lesser extent) is based on a literal interpretation of the rules (with a seasoning of 'wiggle-room' for peccadilloes). So while it's understandable to hear from some of you that you don't see the problem, some of us really, really see a big issue here. "I'm not going to complain loudly about the ethics side, although I personally find it curious that Fadi was there on ICANN's dime, yet once again making announcements 'in his personal capacity'. A CEO can never be in his personal capacity, in my view until he gets his cardboard box. (It was strange how the reporters describe him as ICANN's CEO, though. Oh yes, that's because he IS. Even yet.) The issue is that the head of ICANN, voluntarily handed in his resignation, choosing to leave early, before transition was complete, and in another revolving-door shocker joined an organisation with an apparently completely different world view, and chose Wuzhen to make supportive statements of them and their backers. "Once again, 'it's not what they say, its what others hear'. UK public servants have a purdah period before moving to organisations that operate in the same sphere. Why, in the name of accountability, does ICANN still not? (Have we forgotten and already discounted the terrible optics of Dengate-Thrushgate?). A mere six months would not be onerous. Please don't dissect Fadi's actual words. They don't count. Hardly at all. It's the nature of 'who', 'where', and 'when' that counts much more than 'what', or even 'why'." "... Where I come from [U.S.], any public official (and let's not kid ourselves -- that is what Fadi is) who did what Fadi did would be subject to discipline if not removal. While acting in a public role, the official has no private capacity -- none at all. At least in the world I inhabit that prohibition is so stringent that it applies even to actions that would be (under any reasonable test) so clearly distinct that the likelihood of confusing the public role with the private role was virtually non-existent. For a particularly telling recent example of this, consider this story: Meet the author of ‘The Revenant’ — except you can’t because of his federal job - The Washington Post .... But as I said, here we [U.S.] are so cautious about even the appearance of impropriety that the author is not doing any public relations for his movie. As others have pointed out for Fadi the possibility of confusion is clearly much higher -- the press and the public will (and have) [*see below] linked his new "personal capacity" job to his current status as CEO of ICANN -- which is of course exactly why he was hired and exactly what the Chinese wanted. Frankly, as ... said, I find his behavior troubling and remarkably tone deaf. I should add that the purpose of the restriction on trading on your public position works both ways. We worry not only about the new "private" connection currying favor with public official, we also worry that the official may make decisions in his public capacity that are now to benefit his future private actions rather than the public interest. It isn't the connection and the cooperation that is troubling (as ... notes) -- it is the promise of future employment with unknown benefits that was made while the public official was still working for the public that raises the questions." You can read about "Dengate-Thrushgate" involving a prior ICANN Board Chairman here. ICANN has quite a history of conflicts of interest, lack of accountability and transparency, secrecy, rewarding insiders including ICANN officers even after resigning due to "conflicts of interest". None of this comes as a surprise since Chehade's tenure as ICANN CEO has the worst record on conflicts of interest, appearances of impropriety, and "cronyism" in the history of ICANN--see Domain Mondo's RPMs comment (pdf). Complicating all of this is the ICANN Board's apparent dysfunction and failures in competent corporate governance, including its inability to have "in place" and "enforce" an effective code of conduct for all ICANN officers and staff. The Board appears to be in a constant "reactive" mode trapped between stakeholders (mostly "lobbyists") and ICANN officers/staff. CCWG-Accountability should have concentrated on core competencies including the selection, orientation, training and continuing education of ICANN Board members, ICANN officers and staff, as well as stakeholders. Anyone involved in ICANN needs to have at least a rudimentary understanding of California non-profit corporate law, ethics in the public non-profit corporate sphere, applicable U.S. law, and the common law system. Jurisdiction matters. A good joint project for ICANN legal, Jones Day, and CCWG's independent legal counsel, post-transition, would be to develop and publish an orientation and training program accessible to all online, which should be required of all ICANN directors, officers, and staff, as well as anyone choosing to stand for election or appointment to the ICANN Board. Good corporate governance is hard work and not easy--witness the scandals at organizations as diverse as FIFA and the American Red Cross. If the CCWG-Accountability is able to propose anything which will ameliorate this morass of self-interest, greed, and narcissistic, inflated egos (from ICANN CEOs to ICANN directors, officers, staff, and stakeholders), it will have accomplished more to remediate a dysfunctional, corruptible ICANN, than any person or group in ICANN's 17-year history. Why Did ICANN Become a Member of Trademark Lobbyist Group INTA? Note: this post originally published under the title: After Wuzhen, Should ICANN President CEO Fadi Chehade Be Forced Out? Seventeen individuals have been selected to serve on the team that will review ICANN's New gTLD Program (new generic top-level domains) in relation to competition, consumer trust and consumer choice (CCT). Review team members represent "an array of geographic regions and areas of expertise, and have demonstrated knowledge of the New gTLD Program or one of the review areas" according to ICANN. *The Affirmation of Commitments allows the ICANN CEO (Fadi Chehadé) and GAC chair (Thomas Schneider) to serve on the review team or designate representatives. As shown above, the ICANN CEO will be represented by ICANN's Jamie Hedlund, and GAC Chair by Laureen Kapin, of the GAC Public Safety Working Group and the U.S. Federal Trade Commission. The CCT review team is expected to convene for its first meeting in January 2016 and complete a final draft of its report by December 2016. Periodic updates on the review will be made via icann.org and at ICANN public meetings. Further information on the review process and members of the review team may be found here. Urban Ladder: Rising High - Urban Ladder has a simple mission – 1 million beautiful homes in India (re: home decor, furniture, startup using venture capital). The company, rather than focusing on hyper growth, is firmly rooted in design and curation, and Ashish Goel believes that’s what is going to make them tough to beat as a complete home solution provider over the next few years. a peaceful and prosperous New Year! Alex Garland: "Ex Machina" | Talks at Google - Writer, producer, director Alex Garland visited Google to discuss his directorial debut movie EX MACHINA. Moderated by Dana Han-Klein. Caleb, a 24 year old coder at the world's largest internet company, wins a competition to spend a week at a retreat belonging to the company's reclusive CEO, Nathan. But when Caleb arrives he finds that he will have to participate in a fascinating experiment with the world's first true artificial intelligence, housed in the body of a beautiful robot woman, Ava. Truths, emotions and motives are blurred as the relationship between Caleb, Ava and Nathan intensifies. ICANN Accountability, What Is The Global Public Interest (GPI)? A dispute is brewing between the ICANN Board of Directors and the Cross Community Working Group on Enhancing ICANN Accountability (CCWG-Accountability)--which is part of the IANA Stewardship Transition process--over the definition of, or application of, the term "global public interest" (GPI) as it applies to the CCWG-Accountability proposal. CCWG-Accountability Question: "What are the legal basis and criteria by which the Board considers a given Recommendation to be contrary to the Global Public Interest? Clarification would really be useful to help our group, but also the Chartering Organizations, to check our own recommendations." and (v) engaging in any other related lawful activity in furtherance of items (i) through (iv)." By inference therefore any specifics of a proposal that could result in limiting ICANN’s ability to deliver on this role is a concern to the ICANN Board." "With respect Bruce, that is not responsive. Your last statement that " any specifics of a proposal that could result in limiting ICANN’s ability to deliver on this role is a concern to the ICANN Board" is a truism -- but there are many things that might limit your ability (lack of funding say) that are not in any way connected to the global public interest. You cannot possibly mean that if the Board thinks it limits ICANN it is, by definition, not in the GPI -- or if you do mean that then the Board has a very, very inflated sense of itself and the relative importance of its mission. "Likewise there are many things in the global public interest that would improve (or at least not diminish) ICANN's ability to deliver the services it is tasked with delivering. You can't possibly be saying that things which are affirmatively in the global interest (greater diversity, for example) are not in ICANN's definition of GPI if they can be judged by ICANN to interfere with its operations. That, in effect, gives the Board a veto to say that it if adversely effects us, it can't be in the GPI -- even when the broader definition of GPI clearly suggests that it is. "The Board's objection to enhanced transparency (in its comments on the Third Proposal) is a perfect example of this latter case -- the Board substituting its own judgement of what is good for ICANN for a judgment of what is in the GPI. I am more than willing to agree that greater transparency might impose greater process restrictions on Board activity and thus, in some perverse sense, be read to "limit ICANN's ability to deliver" its services -- by putting in more restrictions on what the Board can do. But for the Board to equate that with a restriction that is contrary to the GPI is to mistake ICANN for the globe and ICANN's interests for those of the people it serves. "I continue to be dismayed at this type of response from the Board which reflects a lack of understanding of what the accountability project is all about." ".... 3. This document affirms key commitments by DOC and ICANN, including commitments to: (a) ensure that decisions made related to the global technical coordination of the DNS are made in the public interest and are accountable and transparent; (b) preserve the security, stability and resiliency of the DNS; (c) promote competition, consumer trust, and consumer choice in the DNS marketplace; and (d) facilitate international participation in DNS technical coordination. 4. DOC affirms its commitment to a multi-stakeholder, private sector led, bottom-up policy development model for DNS technical coordination that acts for the benefit of global Internet users. A private coordinating process, the outcomes of which reflect the public interest, is best able to flexibly meet the changing needs of the Internet and of Internet users. ICANN and DOC recognize that there is a group of participants that engage in ICANN's processes to a greater extent than Internet users generally. To ensure that its decisions are in the public interest, and not just the interests of a particular set of stakeholders, ICANN commits to perform and publish analyses of the positive and negative effects of its decisions on the public, including any financial impact on the public, and the positive or negative impact (if any) on the systemic security, stability and resiliency of the DNS .... 9.1 Ensuring accountability, transparency and the interests of global Internet users: ICANN commits to maintain and improve robust mechanisms for public input, accountability, and transparency so as to ensure that the outcomes of its decision-making will reflect the public interest and be accountable to all stakeholders...."
There are few financial (stock) analysts covering the Domain Name Industry (domain name registry operators and registrars) so it was a pleasant surprise to see analyst Paulo Santos (Seeking Alpha) give his take on Domain Name Registrar and new gTLDs Registry operator and services provider, Rightside Group ($NAME, domain name: rightside.co, brands include eNom, Name). 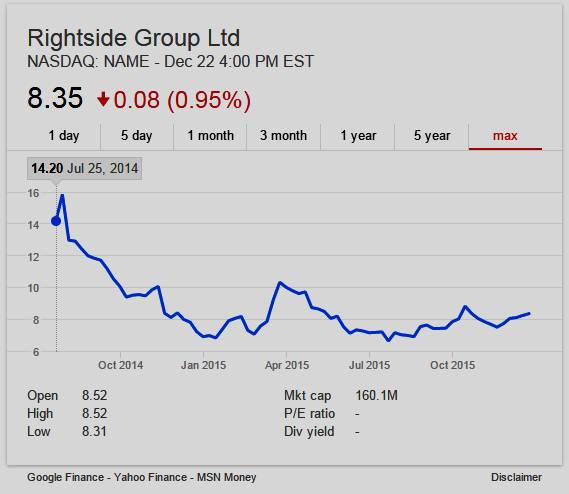 From the chart above, you can tell $NAME stockholders have not had the "best ride" since Rightside started trading as a spin off from Demand Media in 2014. 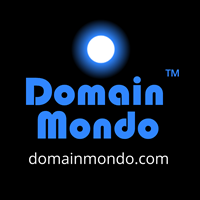 "Namecheap, Inc. represents 27% of its domain names under management. Namecheap still has a $1 million promissory note outstanding, and doesn't seem in the best of conditions. 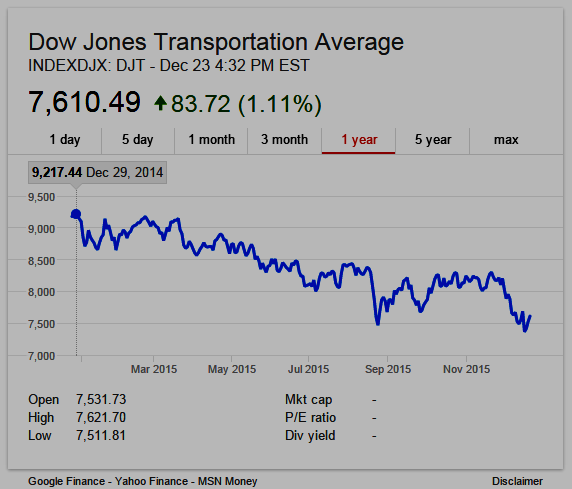 This could lead both to a fundamental impact and negative news flow." It is unclear why Santos concludes Namecheap "doesn't seem in the best of conditions." In fairness to Namecheap, it is among the most highly rated registrars in the business, as is Rightside's own Name registrar. The Q3 2015 10Q filed by Rightside discloses that Namecheap paid $1.5 million during 2015, leaving a balance of only $1 million due December 31, 2015. From SEC filings through today, it is unclear if the remaining balance has been paid in full or a further extension has, or will be, granted. In any event, a reason Santos judges Rightside's valuation as "expensive at present EBITDA run rate" seems to be influenced by the fact that all registrars' margins are thin and it is a very competitive industry, e.g., the Registrar giant GoDaddy has not reported a profit since 2009. Which brings us to Rightside's new gTLDs. The new gTLDs' future potential profitability "means NAME [Rightside] deserves to be monitored ... gTLDs work like a legal monopoly of sorts, and can result in very favorable economics, as Verisign [registry operator of TLDs .COM and .NET] shows." U.S. Prepares To Relinquish Oversight Of Internet To International Body : NPR: "Do you think this will really happen next year? Your group had a meeting in Dublin this fall and came away with some questions about whether this is really on track. ICANN CEO Fadi Chehade: "We are on track, and it seems like we will deliver the final proposal to the U.S. government in January of 2016."" But see Congress Should Reject ICANN Transition Proposal Unless Significant Changes Are Made (by CCWG-Accountability participants Brett Schaefer & Paul Rosenzweig), December 22, 2015: ".... The NTIA has emphasized over and over again, the U.S. government “has not set any deadline for the transition.” This is the correct perspective. ICANN accountability and insulation from undue government influence is critically important to the future vitality, stability, and openness of the Internet. It is far better to get this process done right than it is to get it done on time." Will the ICANN Board be able to forward to the US government (NTIA) a proposal for the IANA Stewardship Transition by the target date January 22, 2016? It appears doubtful based on the status of the work of the Cross Community Working Group on Enhancing ICANN Accountability (CCWG-Accountability). 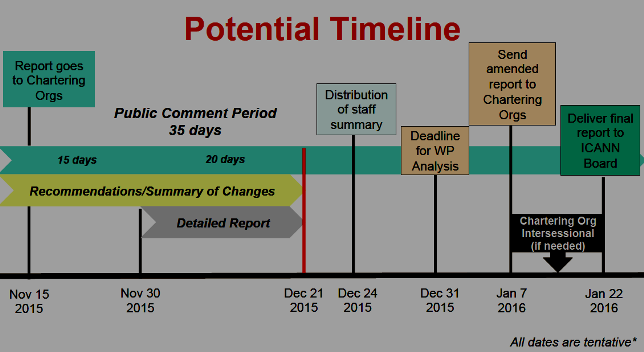 ICANN's CCWG-Accountability met Tuesday, December 22, 2015, following the close of the comment period on the Third Draft Proposal. Notes, Transcript, and Recording of the meeting are (or will be) posted here. 80 comments to the Third Draft Proposal. Download page here. consolidated position statement by the middle of January. The GNSO Council will have 2 calls in early January and plans to have a motion by January 14. Most GNSO SGs and Cs have submitted direct comments, but these will be consolidated in early January." We should not wait for January 14 (foreseen GNSO submission) to conduct assessment. We already have received a number of submissions from GNSO constituencies. Unrealistic to expect that potential supplemental report will be published by January 7. We will need to consider whether there is a need to increase frequency of calls or need to set up subgroups to address topics. Mission, Commitments & Core Values: "we have fundamental divide about potential unintended consequences." ... Different camps: 1) ICANN should not engage in any activity related to content regulation; 2) ICANN must be in a position to do so. How can we reconcile these differences? Suggestion to consider attempt mitigation friction by adding language that limits risk of ICANN exercising monopoly. Where contractory voluntary offers limits. Co-Chairs/Becky Burr to discuss with external counsel whether there are ways to use competition law in trying to mitigate friction.